Moot Court is a big part of most law schools. At my school, and most law schools from my understanding, there are two big optional opportunities to try out for after 1L year: Law Review and Moot Court. Law Review is a more research and writing based activity where you spend your time writing and editing a not/comment on a specific area of law. Moot Court allows you to practice and hone oral advocacy skills through competition as well as practical legal writing skills through the accompanying written brief. 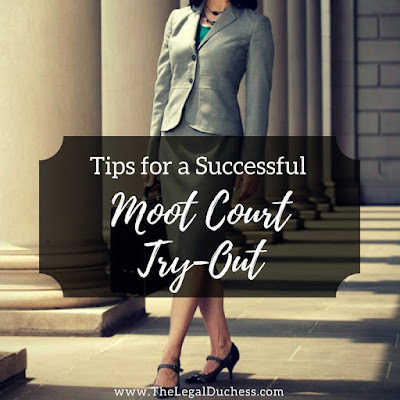 Personally, as I want to go into criminal prosecution and trial work, Moot Court seemed like the right fit for me over Law Review because I really wanted to hone my oral advocacy skills. I tried out for Moot Court at my school, was selected for the Products Liability team and I am preparing for a national competition in March. Throughout my process of trying out for and being selected for Moot Court and my interscholastic appellate advocacy competition this Fall in which I made it to the final four and presented my argument in front of three real federal judges, I think I have figured out a few tips for being successful in the Moot Court setting. For those preparing for Moot Court try-outs or oral arguments this spring, I sincerely hope this helps in your preparation. Moot court try-outs are fashioned after the format of the competitions. You will write a brief or be given one, you must read every case cited and be able to competently discuss them, be fluent in the relevant law and anticipate any possible holes in the logic. Whomever the judges on your panel are, they will attack any weakness in your argument. You must be prepared for this and be able to consistently counter with your argument strengths. If you are prepared and have practiced your argument and answers to possible questions, you will do great. This may seem silly and basic but it is simple truth. You must argue with confidence. Be confident in your argument, your material and yourself. If you can present an image of poise and confidence, you will have a better chance. Fake it until you make it they say; even if you are nervous, if you can project an image of confidence, you will be in good shape so long as you are also properly prepared. Boys, wear a dark-colored suit. Girls, a dark-colored suit and low heels. I know it is formal and boring but it is the nature of the profession. I know more about what the girls should wear than the boys so I will focus on that. A dark colored suit is necessary; traditionally, a skirt suit is best but a well-fitting pantsuit is not wrong. Invest in a quality suit and if it is not a perfect fit, a good tailor can make it lok custom made. Simple hair-do's are best. No bright colored nail polish but make sure nails are clean and not chipped or overly long. Wear simple jewelry such as small studs, a simple chain necklace and a watch. Flesh colored nylons are encouraged. Low heels are best in a neutral color. Some say to wear only matte leather or suede but I always wear patent leather 3' heels and I have never gotten chastised for it. Soft makeup is best; don't overdo it. Your outfit and appearance should be classy and modest and allow your argument and intellect to shine through. Open every argument with "May it please the court"
While Moot Court is a formal activity, it is also important to make the process conversational. You are not preaching; you are having a formal conversation with the judges. Smile, try to be natural and have some fun while you are doing it. It can be very invigorating and enjoyable to compete when you are prepared and can maintain your position. Try to make it a fun experience and not a scary/stressful one. I hope this is helpful! I wish everyone the best of luck in Moot Court try-outs and oral arguments this spring.